同样也是使用OSM数据来导航的免费软件。地图包括：Andorra, Argentina, Australia, Austria, Benelux (Belgium, Netherlands, Luxembourg), Brazil, Canada, Croatia, Czech Republic, Denmark, Finland, France, Germany, India, Ireland, Italy, Latvia, Mexico, Monaco, Netherlands, New Zealand, Norway, Poland, Portugal, Slovenia, South Africa, Spain, Sweden, Switzerland, UK. 是緯度，格式是degree * 100 + minutes。但是minutes是100進位，所以要/100 * 60轉為degree，轉換後就是25‘02‘39.228‘‘. 是經度，格式是degree * 100 + minutes。minutes一樣要做/100*60的轉換，轉換後就是121‘21‘29.02‘‘. 2.$ 後是Message id. 5個ASCII Code. Parity : 0 : None, 其他1 2代表Odd, 2代表 Even. // 打开串口 OPEN THE COMM PORT. // 如果串口没有打开，就打开 IF THE PORT CANNOT BE OPENED, BAIL OUT. // 设置通信超时时间 SET THE COMM TIMEOUTS. // 设置串口 SET BAUD RATE, PARITY, WORD SIZE, AND STOP BITS. Wireless connectivity allows you to place the GPS receiver in an optimal position, while easily viewing and accessing your PDA or PC. The SiRF Star-III chipset and 20 parallel satellite-tracking channels ensure high sensitivity and fast acquisition and reacquisition. Don‘t bother with bulky plug-in receivers and cables — turn any Bluetooth-enabled PDA, PC, or smart phone into a GPS navigation system with this tiny, super-sensitive, super-fast GPS receiver! This GPS receiver works with any Bluetooth-enabled mobile computer that runs NMEA-compatible GPS software or the included flash-based software. A mini-USB port means you can also use this receiver as a GPS mouse for use with non-Bluetooth devices. A built-in rechargeable Li-ion battery means no need to plug in power capbles for at least 10 hours. Compare our prices with other sellers and save! 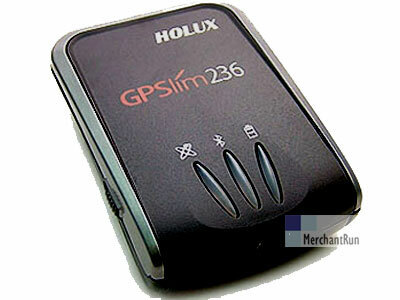 Package Includes: Holux GPSlim236 Bluetooth GPS receiver, AC power adapter (EU round two-prong; U.S., Aus, and UK plug adaptors included), Cigarette lighter power adaptor, CD with Windows and Pocket PC drivers (navigation software not included), Quick Installation Guide, Removable rechargeable Li-ion battery. Humidity: 5% to 95%. No condensing.